Neck pain and strains can be difficult to treat, but taping can provide you with some relief. 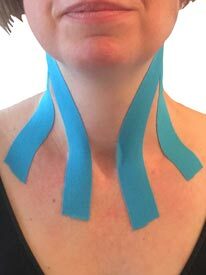 Tape can help your neck feel more supported and provides light compression. 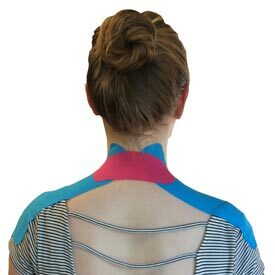 Whether it’s the back, side or front of your neck, there are taping applications that can help. Neck pain may be related to a shoulder injury, which is why we have included applications that involve the shoulder as well. While tape is designed to be applied any time, it’s most important if you’re planning on doing something physically active. If you think you may do an activity that could strain your neck, make sure you apply tape beforehand. It acts as a support from the outside to prevent damage to the soft tissue deep below your skin. Please keep reading for step-by-step application instructions. NOTE: This application was applied over clothing for demonstration purposes only. When using this application, apply it directly to your skin. Using no stretch, anchor the tape to the right of your spine, 4 inches below your hairline on the back of your neck. Peeling the rest of the backing off, use 25% stretch to pull the tape up your back to your neck. Using no stretch, anchor the tape to the left of your spine, 4 inches below your hairline on the back of your neck. Peeling the rest of the backing off, use 25% stretch to pull the tape up your back to your neck, ensuring that it doesn't touch the first piece you applied. Take a third full length piece of tape and tear the backing in the middle, peeling it away so you are holding onto the two anchor ends. Using 80% stretch, apply the middle portion of the tape horizontally over the point of your pain. Peel off the rest of the backing and lay down the ends of the tape with no stretch. Anchor the tape on your right side, directly below your hairline on the back of your neck. 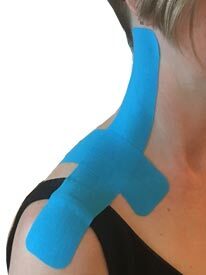 Peeling the rest of the backing off, use no stretch to apply the tape down the length of your neck, traps and top of your shoulder. Take another full piece of tape and tear the backing off one end. Anchor the tape on your left side, directly below your hairline on the back of your neck. The second piece should be a mirror image of the first. Take a full length piece of tape and cut it in half, rounding the edges so you have two pieces that are each about 5 inches long. 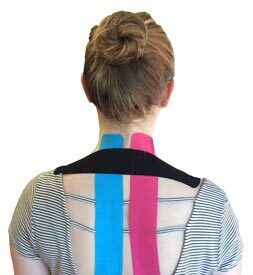 Using 50% stretch, apply the middle portion of the tape horizontally to the back of your neck, wherever the pain is most prominent. Peel the rest of the backing away and lay down the ends of the tape with no stretch.